One of my favorite Puerto Rican snacks are tostones. Tostones are fried plantains that taste a little like chips. I guess they are in a sense banana chips but with a little more bite to them. I first had them on a trip in Puerto Rico. 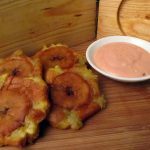 Since then I’ve been making them whenever I have the craving or see some really good plantains. Peel the plantain and cut it into 1-inch chunks. Remember, this needs to be a very green plantain. No excuses or else you’re changing the name of the dish. Fill the deep fryer with oil. Turn on the heat. For deep fryers, I like to go 375 degrees. For the stovetop, I’d go medium-high. If you don’t have a deep fryer, use a pot. Place the plantains in the oil and fry until golden brown. So about 5 minutes. Remove the plantains from the pan and flatten the plantains. If you’re fancy, you’ll own a tostonera (see picture). 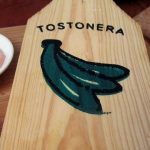 A tostonera is a fancy gadget to flatten plantains to make into that tostones shape. In reality, true islanders use a can of bean on your cutting board. Ok, press the deep fried plantain down into a flat disk. The thinner the better but that all depends on how you like them. Here’s the important part. Like Korean fried chicken, you have to let these plantains cool off, to get ready for a 2nd fry. Even for 5 minutes. The cooling down process with make sure they don’t burn on their 2nd fry. Yes, I said 2nd. 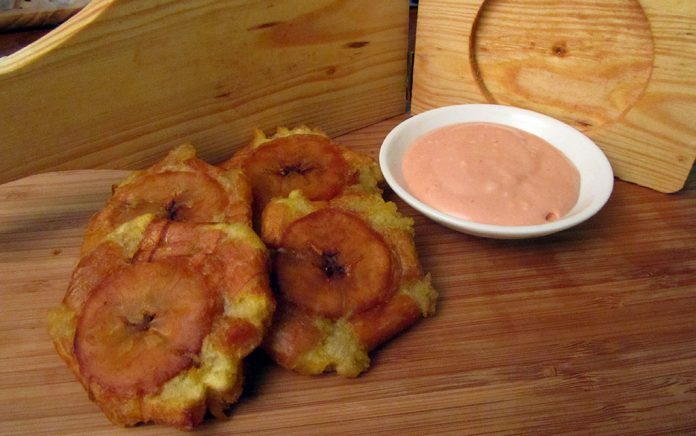 Take the cooled flattened plantain and throw them back into the deep fryer to get them crisp. I’d go another minute on them. The other important step is to add salt once you remove them from the fryer. Next articleWhat Do the Numbers on My Tire Mean? Here’s the sauce. Puree 2 garlic cloves in a food processor with 1/4 cup olive oil. Add 1 chopped scallion, 2 teaspoons white vinegar and 1/4 teaspoon each cumin seeds and red pepper flakes; pulse until combined.